Vermont breakfasts, real talk on being a good listener, the power of disconnecting, raft trips and that one time at French camp. In the 7th episode of Long Underwear, Amie Engerbretson talks to skier Jim Ryan. This year’s film was Jim’s first time being in a ski film, first time skiing in Alaska and first time ever heli skiing. Needless to say, it was his “break out year”. 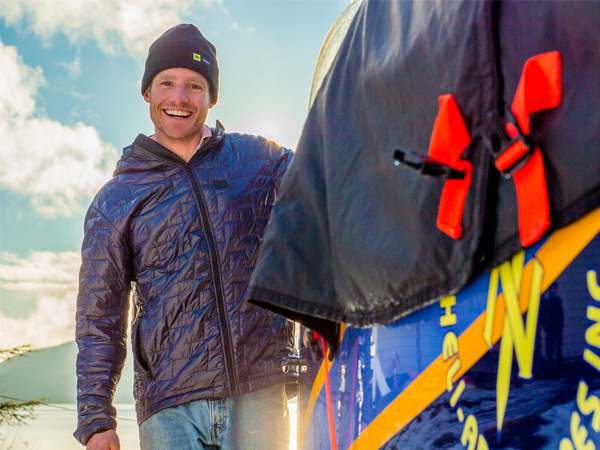 Jim talks about the pure excitement he felt during this trip with fellow skier Dash Longe. The two had fun making lemonade out of not-so-amazing conditions and Dash helped him with everything from putting his skis in the helicopter correctly to having the right mindset. Jim goes on to talk about what being a Vermonter means to him from recycling to elaborate breakfasts to his roots in caring about his community. Amie asks Jim what he thinks his best quality is (other than being a ripping skier) and he explains that he’s always tried to be a good listener—which has come naturally and has also taken some work. His advice to anyone who wants to be a better listener is to just have to pay attention. “You stop talking so much, and you maybe learn something… kick back and take it in for a sec,” he says. From here, Jim tells Amie what he’d do if he ruled the world for a day and he tells her about his personal efforts to not allow digital screens to rule his life. Whether it means leaving his phone at home or multi-day raft trips where no one is using their devices, he explains what disconnecting can do for the human spirit. As the conversation moves along, Jim talks about what it means to him be on time, how he blew out the back tire of an electric scooter in Salt Lake City and the accolades he received in his high school year book. Jim tells Amie about the highs of scuba diving with his dad and the one day he spent laying around in aspen groves in Colorado. And to wrap it all up, Jim tells the story of when he shared one of his coolest moments in the mountains while at a strict French language camp. Follow Jim on his future adventures here.